Fr. John Whiteford shares from Mark 8:34-9:1 on the Sunday of the Holy Cross. Fr. 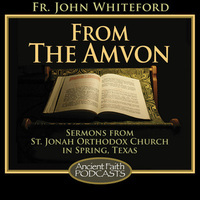 John shares his homily from the Feast of the Annunciation and the Sunday of the Holy Cross. Fr. John addresses the differences between true and false unity as it relates to the Orthodox Church and Roman Catholicism. Fr. John continues his series from Psalm 118.